Rub sandpaper against the stone * Diamonds are one of the world’s hardest materials, so this is an easy test. If it’s real, it will remain perfect, if it’s cubic zirconia it will get scratched – oops 😒! Do the fog test * Aaaah! If it’s a fake, it will fog up for a short period, whereas a real diamond’s fog will last longer because diamonds retain heat. It helps to have both so that you can see the difference. Looking through a loupe * Having that little thingamajiggy is probably the most telling. A magnifying glass (at least 10x magnification) will allow you take a closer look at your gem and its setting. There are several things you will see: Firstly, if you don’t clean your jewellery frequently, you’ll probably notice how dirty it is 😲! Your gems don’t like hand cream, cooking and baking! So, clean it with an old toothbrush and mild soap. Voila, now look through the loupe again! Secondly, most diamonds are made by mother nature so that means you’re going to see some imperfections. A fake stone would be perfect! Word of caution: unlike CZ, certain lab-grown stones and moissanite will also look perfect with a loupe, so you should be cautious before discarding perfect gems. It can be a clue, however, that you should take a closer look or bring the stone to your Jeweller. Thirdly, check the diamond’s edges. When you’re looking at a diamond through a loupe, a real stone is going to have sharp edges, and a fake stone will have rounded edges. Lastly, look at the setting and stamp, especially any marks that signify what metal was used. If the metal is gold-plated or silver, chances are it’s not a diamond. 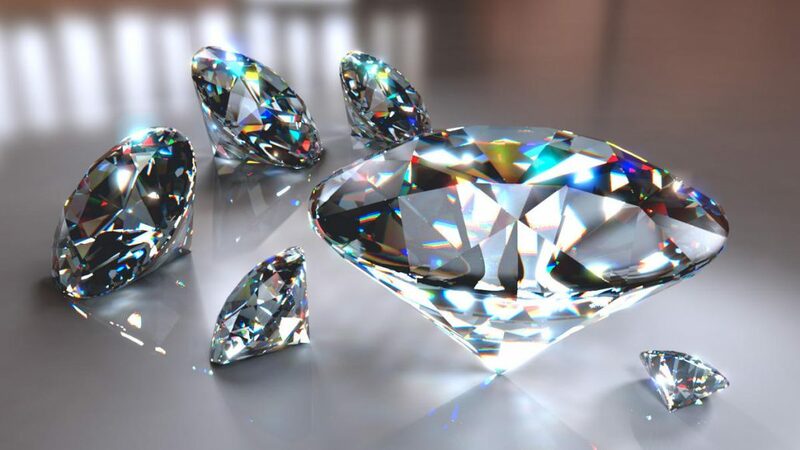 Diamonds are traditionally set in gold or platinum. Hold it to the light to see how it sparkles * The sparkle of a diamond is unique: inside the stone, the diamond will sparkle grey and white (known as “brilliance“) while outside the gem it will reflect the colour of the rainbow onto other surfaces. This dispersed light is known as fire. On the other hand, a fake diamond will have rainbow colours that you can see inside the diamond. Look at the stone’s refractivity * Diamonds’ refractive indexes are very high, which makes them very sparkly. Therefore, you shouldn’t be able to see through the diamond to the other side – if you can, it’s a very bad sign 😟! Now that you know how to spot a fake diamond; and that the miniature telescope thingamajiggy is a loupe, I hope you feel more confident with your next diamond purchase. Thanks to Business Insider for these useful tips. Celebrating 34 years with Carat? Karat? Carrot cake? She Said Yes!